The Kenny Laboratory is focused on understanding the neurobiological mechanisms of drug addiction, obesity and schizophrenia, with an emphasis on the role of nicotinic acetylcholine receptors (nAChRs) in these processes. They employ a multidisciplinary approach that includes complex behavioral paradigms, physiological analyses and molecular biological techniques. Current projects include the utilization of vector-based delivery systems to modify gene expression in the brains of rodents to identify novel signaling cascades that may play a role in addiction-like behaviors. Our research is focused on understanding the molecular neurobiology of drug addiction and obesity, with an emphasis on developing novel therapeutics for these disorders. We take a multidisciplinary approach that includes mouse behavioral genetics, viral-mediated gene transfer, protein and RNA biology, and we combine these techniques with complex behavioral procedures to better understand the mechanics of addiction and obesity. Current projects include understanding the role of noncoding RNAs and other epigenetic machineries in addiction, identifying the nicotinic receptor subunits that regulate tobacco dependence, investigating the role of brain reward pathways in obesity, and developing small molecule therapeutics for addiction. Running Cell Metabolism Oct 2015on Empty: Leptin Signaling in VTA Regulates Reward from Physical Activity. Cell Metabolism. 2015 Oct 6; 22(4):540-1.doi: 10.1016/j.cmet.2015.09.021. Brain Research. 2015 Aug 4. pii: S0006-8993(15)00592-2. [Epub ahead of print] Review. An Accessory Agonist Binding Site Promotes Activation of α4β2* Nicotinic Acetylcholine Receptors. Wang J, Kuryatov A, Sriram A, Jin Z, Kamenecka TM, Kenny PJ, Lindstrom J. The Journal of Biological Chemistry. 2015 May 29;290(22):13907-18. Using opioid receptors to expand the chemogenetic and optogenetic toolbox. Neuroscience: Binge drinking and brain stress systems. Promoting FOS to an enhanced position. Scientific American 2013 Sep; 309(3). Dopamine D2 receptors and striatopallidal transmission in addiction and obesity. Kenny PJ, Voren G, Johnson PM. Current Opinion in Neurobiology 2013 Aug; 23(4). Frontiers in Genetics 2013 May; 4(43). Exploring the epigenetics of cocaine resistance. Hope BT, Skinner MK, Kenny PJ, Akbarian S.
Nature Medicine 2013 Feb; 19(2). Molecular, cellular, and structural mechanisms of cocaine addiction: a key role for microRNAs. Normal midbrain dopaminergic neuron development and function in miR-133b mutant mice. Heyer MP, Pani AK, Smeyne RJ, Kenny PJ, Feng G.
Journal of Neuroscience 2012 Aug; 32(32). Disubstituted piperidines as potent orexin (hypocretin) receptor antagonists. Jiang R, Song X, Bali P, Smith A, Bayona CR, Lin L, Cameron MD, McDonald PH, Kenny PJ, Kamenecka TM. Bioorganic and Medicinal Chemistry Letters 2012 Jun; 22(12). MicroRNAs in neuronal function and dysfunction. Trends in Neurosciences 2012 May; 35(5). Bali P, Im HI, Kenny PJ. Habenular α5 nicotinic receptor subunit signalling controls nicotine intake. Fowler CD, Lu Q, Johnson PM, Marks MJ, Kenny PJ. Reward mechanisms in obesity: new insights and future directions. MeCP2 controls BDNF expression and cocaine intake through homeostatic interactions with microRNA-212. Im HI, Hollander JA, Bali P, Kenny PJ. Nature Neuroscience 2010 Sep; 13(9). Striatal microRNA controls cocaine intake through CREB signalling. Hollander JA, Im HI, Amelio AL, Kocerha J, Bali P, Lu Q, Willoughby D, Wahlestedt C, Conkright MD, Kenny PJ. Dopamine D2 receptors in addiction-like reward dysfunction and compulsive eating in obese rats. Nature Neuroscience 2010 May; 13(5). Richard O’Connor is the recipient of the 2016 Pfizer, Inc. Postdoctoral Fellowship. The award presentation ceremony will take place during the Obesity Society’s annual scientific meeting in New Orleans, LA in November. The fellowship will focus on “Central Control of Obesity, with an emphasis on mechanistic studies to deepen our basic understanding of the homeostatic and reward neurocircuitries underlying food intake” (August 2016). Diane Damez-werno and Richard O’Connor receive Mentor Recognition from the Icahn School of Medicine at Mount Sinai’s Center for Excellence in Youth Education for the Lloyd Sherman Scholars Program (August 2016). Molly Heyer and Alex Smith presented at the 2015 American College of Neuropsychopharmacology (ACNP) Annual Meeting in Hollywood, Fl. Alex Duncan, Molly Heyer, Sietse Jonkman, Alex Smith, and George Voren presented posters at the 2015 Society for Neuroscience (SfN) Conference in Chicago, Il. Ryan Hakim, NIDA Summer Intern, was selected to present his summer research internship project in the Kenny Lab to the NIDA staff in Bethesda, MD (September 2015). 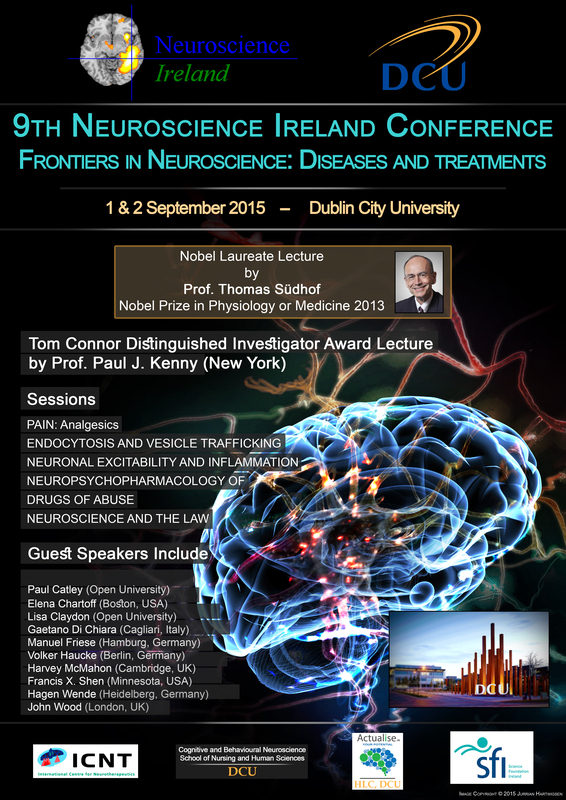 Paul Kenny received the Tom Connor Distinguished Investigator Award at the 9th Neuroscience Ireland Conference on Frontiers in Neuroscience: Diseases and Treatments (September 2015). Paul Kenny was an invited Mars Keynote Speaker for the Society for the Study of Ingestive Behavior (SSIB) annual conference (July 2015). Paul Kenny was a speaker and session chair at the Janelia Conference on Motivational Circuits in Natural and Learned Behaviors (March 2015). Paul Kenny was the distinguished guest speaker at the third annual Waggoner Center for Alcohol/Addiction Research Conference at the University of Texas at Austin (March 2015). Paul Kenny was elected a Fellow of the American College of Neuropsychopharmacology (ACNP). Paul Kenny was elected as Member of the Advisory Council for the National Institute on Alcohol Abuse and Alcoholism (NIAAA). Paul Kenny was a presenter during the NIDA Mini Convention (November 2015) and presented his talk on Circulating microRNAs as Addiction Biomarkers during the Extracellular RNAs in Neuroscience: Biology, Biomarkers and Therapeutics session. Paul Kenny was an invited speaker at the Nebraska Research and Innovation Neuroscience Conference (September 2014) . His talk was on Mechanisms Underlying Motivational Properties of Nicotine. Paul Kenny was an Invited Speaker at the Molecular Basis of Addiction: Synaptic Modification (with Marc Caron, and David Sulzer), American Society for Biochemistry and Molecular Biology ASBMB), San Diego (April 2014). His talk was on Molecular Basis of Addiction: Synaptic Modification. Paul Kenny gave a Basic Science Theme Lecture (February 2014) on New Insights into the Mechanisms of Compulsive Nicotine Intake during the Society for Research on Nicotine and Tobacco (SRNT) Conference in Seattle, Washington. Paul Kenny received the Mathilde Solowey Lecture Award in the Neurosciences Foundation for Advanced Education in the Sciences, hosted by the National Institute of Mental Health (NIH). Paul Kenny received the Jacob P. Waletzky Memorial Award for Innovative Research in Drug Addiction and Alcoholism from the Society for Neuroscience. What causes cravings for high-calorie foods? Can Eating Junk Food Really Be an Addiction? Junk food is almost as addictive as heroin, scientists have found! Kenny Lab – focuses on the neurobiological mechanisms of drug addiction, obesity and schizophrenia, with an emphasis on the role of nicotinic acetylcholine receptors (nAChRs) in these processes. Diane Damez-werno and Richard O’Connor receive Mentor Recognition from the Icahn School of Medicine at Mount Sinai’s Center for Excellence in Youth Education which houses the Lloyd Sherman Scholars Program for their mentorship of Myles Campbell and Ibirayo Otusile (August 2016). Richard O’Connor presents at the Cells & Circuits Works in Progress (August 2015). Edward Colombo presents his research poster, along with Zuxin Chen, at the 2015 SBCNY Summer Undergraduate Program. Friedman Brain Institute including Paul Kenny, Diane Damez-Werno, Ashley Lepack and Zuxin Chen from the Kenny Lab. Zuxin Chen presenting his poster at the 7th Annual Neuroscience Retreat at The New York Academy of Medicine. Kenny Lab participating in the Summer Hat Party sponsored by the Friedman Brain Institute and Neuroscience Department at the Icahn School of Medicine at Mount Sinai. Photo by Emrick Elias 2014. Research in the Kenny Lab, photos by Cathy Clarke 2014. The Kenny Lab at The Scripps Research Institute 2013.